Which old bar do you prefer around New York City? It's time to cast your vote in the newest Golden Local debate. 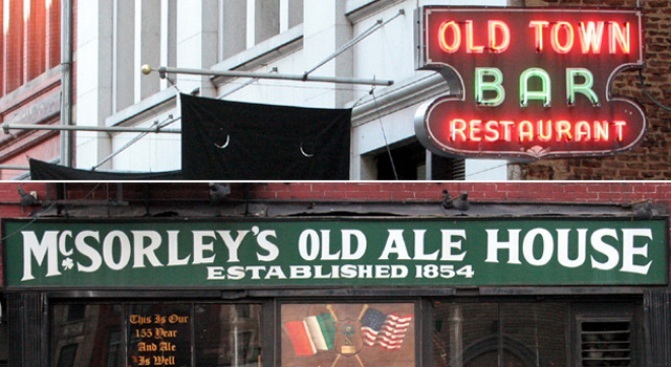 This time around, we're asking you which old bar you prefer in New York City. It's hard to walk into McSorley's Old Ale House and not feel like you're in a history class. Situated on 7th Street on the Lower East Side, the bar is so old that Abe Lincoln of all people has been served here. Up the road a few blocks, Old Town Bar offers a no-frills experience of its own on 18th Street. Many go for the burgers and stay for the cold beer. McSorley's and Old Town Bar aren't too far away from each other, so maybe you can tip one back at both joints this weekend and report back to us. Each has its place in the hearts of many local bar enthusiasts, but only one can win the Golden Local. Cast your vote and weigh in with comments here.